Scorse so lucky who bought at 0.080! oregami the operator is 1st class. best of the best. bojed 0.43 right now. Do you guys think I should top up some more at this current price? I appreciate your feedback. Thanks! Tong Coleman last time all talking bad things about botak, now semua sudah suka hatikah? bojed My next top up will be at 50 cents. Might be a little high, but I've already made enough right now. sirapito warrant price now is equal to exercise value? bojed sirapito: Yes, wb has reached its exercise price with 0.01 discount. Now I'm having second thoughts whether to buy more or not. sirapito better buy. not rugi if expired. can covert with profit. bojed sirapito: Thank you chief. ahbeng ^you missed to buy this stock then you shamelessly ask others to sell...go to hell calvin..
bojed Lol this counter faced a major selling during the opening, and now it's climbing back up. Maybe it's from the same group of people. bojed ahbeng: lol of course. It's okay though, if I can't make money from wb, I'll just convert it to its mother. bojed Look at the queue at 0.40 lol. I believe another green wave is coming in one or two days. sirapito bojed: u buy many lot ka? bojed I thought there would be a strong support at 0.40, given that the queue order at 12pm was of decent amount, but it seems that many wanted to cash out as fast as they can(who doesn't want that lol). 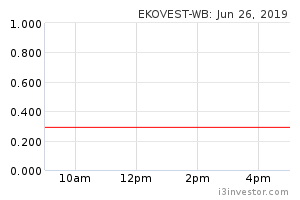 Tomorrow might be the make or break day for Ekovest-WB. 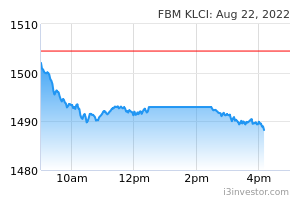 If you've bought at more than today's closing price, you might want to consider taking a cut-loss in the next day or two. You win some, you lose some. bojed ahbeng: true, but we'll see in a couple of days how it will turn out. I'm still holding all of my shares, but I'm prepared for the worst already haha.